Chanteur Country US né Raymond LeRoy Clark, le 11 Décembre 1917 à Springfield (Massachusetts). 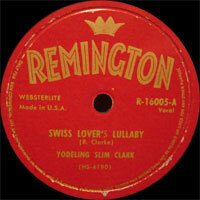 Yodeling Slim Clark est décédé le 5 Juillet 2000. 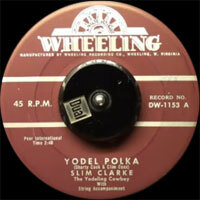 Massachusetts-born Yodeling Slim Clark (originally Raymond LeRoy Clark) was one of the finest Vocalsists in cowboy and western music during the '40s. He claimed that he knew he wanted to be a cowboy singer by age eight, and learned to play guitar and sing listening to records. He began his professional career in 1937, singing throughout central Massachusetts. He began appearing regularly on station WKNE Keene, New Hampshire, in 1941, beginning his recording career five years later for the Continental label, where he cut most of his records, which feature only Clark singing, yodeling and playing his guitar. The songs were largely traditional cowboy and folk tunes, along with a few Wilf Carter songs and some originals, often co-written with Pete Roy. From 1952-1967 Clark had radio and television shows at WABI Bangor, Maine. 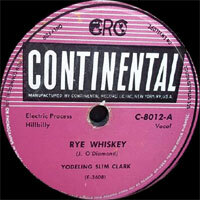 He cut four singles for Doc Williams' Wheeling label in 1953 and later made an album for the Canadian Arc label. 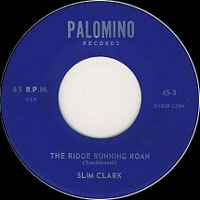 In 1965, Clark recorded a few excellent albums for Palomino records, later becoming a well-known painter of woodland scenes. 195? 78 t. CONTINENTAL C-8072 (US) . Trail Drive To Missoula / ? 19?? EP PLYMOUTH PEP 26 (US) Just Riding On Memories / When I Ride The Range Of Gold / ? / ? 19?? EP PLYMOUTH PEP 40 (US) The Big Stampede / The Abilene Drive / ? / ? 11/1953 SP WHEELING DW 1151 (US) . The Mountie's Prayer / My Little Swiss Mrs.